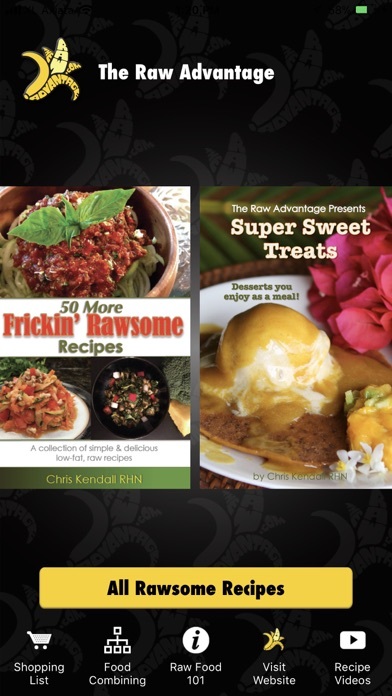 So Blessed to share TheRawAdvantage.com's absolute Best Frickin' Rawsome Recipes and Sweet Treats with you in this helpful new interactive app format! 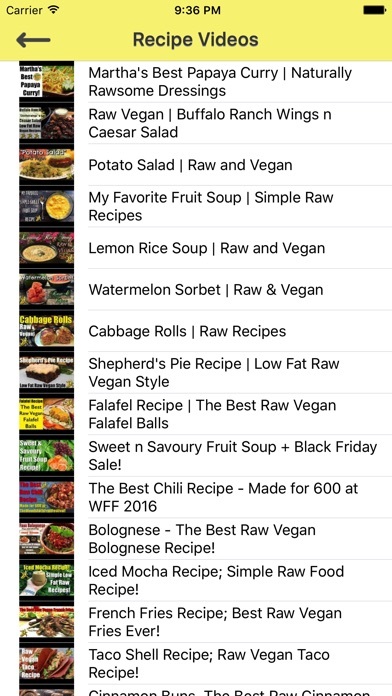 The Recipes, Tools, Tips, Shopping Cart, Videos and Charts in this app can bring amazing results to anyone on any diet as well as make Transitioning to a raw food lifestyle Simple, Delicious and Fun. Whether you are simply looking to: - Add more whole fresh raw ripe foods into your, or your loved ones lives - Overcome a health issue - Loose Weight or put on Muscle - Are a top athlete looking to up your game - Are brand new or a seasoned raw foodist, - Are Vegetarian or Vegan, This App is for you! With over 180 perfectly food combined 80/10/10 style hygienic low fat raw recipes and over 60 “Cravings Busters” transitional low fat raw gourmet recipes, you are sure to satisfy any taste, texture and desire in any situation. Enjoy ease in deciding what to eat with 3 amazing ways to Search for recipes, by ingredient category or keywords, and keep track of what to shop for with a helpful “Add to Shopping cart” function. 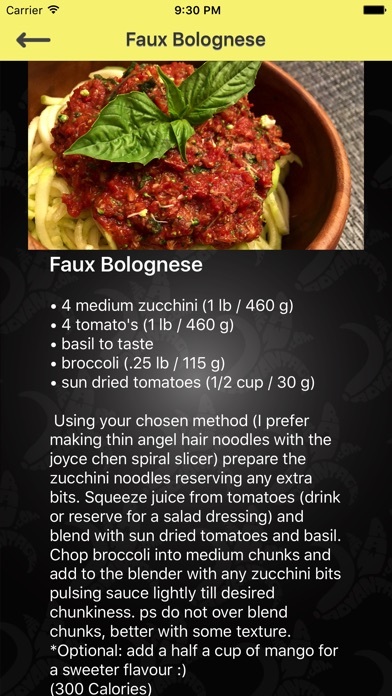 In the spirit of abundance and the wish to share those simple recipes and tips that have so enlivened me, 51 recipes and 50+ seperate recipe videos are included in the app with all of the charts, tips and the shopping cart for free! You have nothing to loose with only sweet and savoury raw satisfaction to gain! I hope you love love love all the recipes! 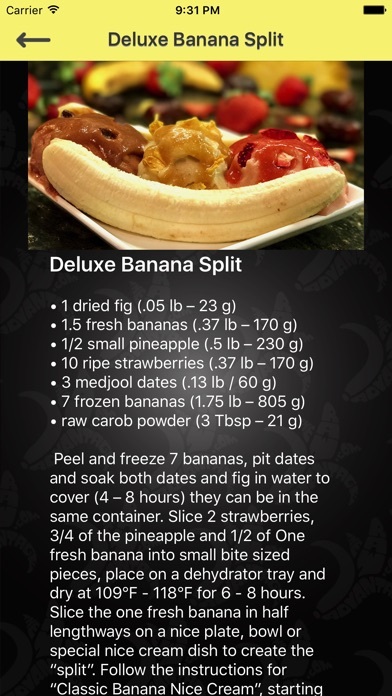 Wishing you much PeaceLovenSeasonalFruit Chris Kendall, aka The Banana Commander FEATURES Preparing awesome simple low fat raw vegan meals anywhere you have your iPhone or iPod has never been so easy. Chris Kendall's “The Raw Advantage Raw Recipes” includes: - 101 Frickin' Rawsome Recipes and 32 TRA Retreat Treats Recipes with easy to follow steps - Mouthwatering crystal clear pictures and detailed descriptions of each and every recipe - Search by category function to view all of your recipes in order - Innovative filter by ingredient function to easily find the specific recipes that you can make from ingredients you have on hand - Quick and easy keyword search to find all recipes by ingredient or recipe name - Clear and concise food combining chart for optimal digestion - Raw Food 101 to help bring clarity to the why and how of a Raw Food Lifestyle - Helpful Shopping cart function, adding entire recipes to the cart with ease - Easily add on to or subtract the total quantity of items in the shopping cart as well as check off and remove from cart as you shop - Informative ingredient conversion chart shows calories and various forms of measurement for each individual food in the recipes - Helpful tips and tricks for every category of 101 Frickin Rawsome Recipes - All recipes in both metric and US Imperial measures - Stylish intuitive design and functionality - Room to add more Recipe Books in future updates - Once installed, no internet connection required to view recipes DESCRIPTION Explore 133 mouth-watering simple low fat raw food recipes with stunning photography before diving into the detailed description that takes you effortlessly through each dish. If Mother Nature was serving Recipes in the garden of Eden, these would be them! Search in a variety of ways that will make Decision making at meal time and in the grocery store a Snap. Add meals at a time to your Innovative Shopping cart with a push of a button or decide what you can make for breakfast, lunch, or dinner from whats in your fridge, pantry or fruit basket without a thought. Enjoy from “101 Frickin” Rawsome Recipes” Revitalizing "smoothies" Awesome"green smoothies" Wondrous "sweet soups" Satiating"savory soups" Original "noodle dishes" Mouthwatering"stews" Excellent "special dishes" Enjoy from “TRA Retreat Treats”: Mexican Night Thai Night Italian Night Mediterranean Night East Indian Night Breakfast Recipes Our Favorite Drink Recipes Also enjoy my newly added books 50 More Frickin' Rawsome Recipes and Super Sweet Treats. Grear for beginner raw foodists.. thank you! Delicious and easy to use! Love it and use it with ease. Recipes are the bomb-dot-com!! A great app I really like that the items are easy to find as I'm from a small town in SD and fruits and vegetables are very limited just the basics, it's nice that it has a add to groceries list and that the recipes don't take long to make. So sorry that I purchased this app. I had no idea it was a scam. I will call my bank and dispute the charges. I rate this app (0) stars but they make you give it at least one star. This app is useless-- or am I missing something? Unless you buy the recipe books as in app purchases there really isn't much to this app at all. There are a few free recipes but not many. I'm really not sure what the purpose of this app is except to sell books as there is not much useful information. Rawesome App for the Raw Curious! I've been following Chris on Instagram for some time now (@therawadvantage) and found out he had an app. I purchased all of the extra recipes and so happy I did. 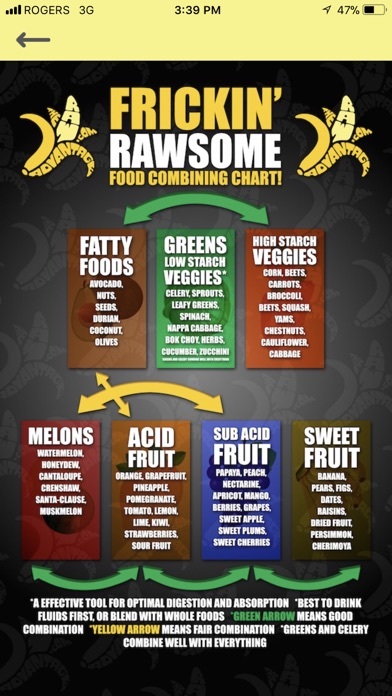 The food combining chart is an excellent guide when I'm not having one of his recipes and sharing them. Thanks for creating this app, Chris! Great Recipes for Every Day AND for entertaining!!! A lot of the recipes on this app are awesome for simple every day health but the retreat recipe section is perfect for when you have friends coming over and you want to make some crowd pleasing recipes without compromising healthy goodness! This app has been great for me while transitioning to a raw vegan diet and has inspired me with all the possibilities of this lifestyle!